Mohsenifar1, Z., Mahdavi, N., Bagheri, S. (2013). Bilateral Multiple Lymphoepithelial Cysts of Palatine Tonsils. Iranian Journal of Pathology, 8(1), 48-54. Zhaleh Mohsenifar1; Nazanin Mahdavi; Sara Bagheri. "Bilateral Multiple Lymphoepithelial Cysts of Palatine Tonsils". 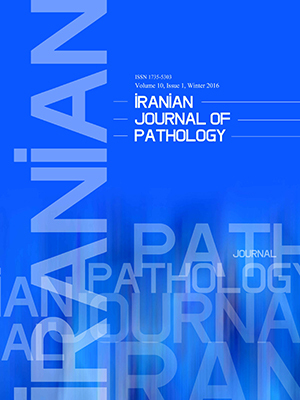 Iranian Journal of Pathology, 8, 1, 2013, 48-54. Mohsenifar1, Z., Mahdavi, N., Bagheri, S. (2013). 'Bilateral Multiple Lymphoepithelial Cysts of Palatine Tonsils', Iranian Journal of Pathology, 8(1), pp. 48-54. Mohsenifar1, Z., Mahdavi, N., Bagheri, S. Bilateral Multiple Lymphoepithelial Cysts of Palatine Tonsils. Iranian Journal of Pathology, 2013; 8(1): 48-54. Lymphoepithelial cyst of oral cavity is a rare cystic lesion that presents as an asymptomatic submucosal mass and is usually discovered during routine dental examinations. The site most commonly affected is floor of the mouth and tonsillar involvement seems to be very rare. Multiple Lymphoepithelial cysts have been reported in parotid of HIV positive patients however in oral cavity they usually present as solitary lesions.We report a case of multiple bilateral Lymphoepithelial cysts of the palatine tonsils in a 72 years old male that presents with fever, pain and obstructive sleep apnea.We didn’t find any bilateral or multiple tonsillar lymphoepiyhelial cysts in the literature and the present paper seems to be the first report. We suggest although lymphoepithelial cysts rarely occur in the tonsils but they should be considered in differential diagnosis of adenotonsillar enlargement and related obstructive sleep apnea. Ahn SK, Won JH, Lee SH, Choi EH, Choi S. Lymphoepithelial cyst associated with epithelial inclusion cyst. Am J Dermatopathol 1996; 18(4):424–6. Young WG, Claman SM. A lymphoepiyhelial cyst of the oral cavity. Oral Serg Oral Med Oral Pathol 1967; 23(1):62-70. Finfer MD, Schinella RA, Rothstein SG. Cystic parotid lesions in patients at risk for AIDS. Arch Otolaiyngol Head Neck Surg 1988; 114(11):1290-4. Kumar VV. Parotid Lymphoepithelial Cysts as an Indicator of HIV Infection. J Can Dent Assoc 2011;77:28. Vargas PA, Villalba H, Passos AP, Saldiva PH, Mauad T, Caiaffa Filho HH, et al. Simultaneous occurrence of lymphoepithelial cysts, cytomegalovirus and mycobacterial infections in the intraparotid lymph nodes of a patient with AIDS. J Oral Pathol Med 2001; 30(8):507-9. Favia G, Capodiferro S, Scivetti M, Lacaita MG, Filosa A, Lo Muzio L. Multiple parotid lymphoepithelial cysts in patients with HIV-infection: report of two cases. Oral Dis 2004; 10(3):151-4. Ferreira Alves CA, Junior OR, Borba AM, Cantanhede S,de Souza OM,da Garcia Naclerio-Homem M. Parotid lymphoepithelial cyst in non-HIV patient. Clin Exp Dent 2011; 3 Suppl 1:400-3. Choi J, Kim K, Kim B. Lymphoepithelial cyst of the palatine tonsil. Ear, nose throat j 2010;89:584-5. Bhaskar SN, Bernier JL. Histogenesis of branchial cysts: A report of 468 cases. Am J Pathol 1959; 35(2):407– 43. Suzuki H, Baba S, Hashimoto K. Lymphoepithelial cyst in the sublingual region: Report of a case and review of literature. Oral Med Pathol 2000;5(2):105–8. Gold C, Lewittown NJ. Branchial cleft cyst located in the floor of the mouth. Oral Surg Oral Med Oral Pathol 1962;15(9):1118-20. Hong SS, Ogawa Y, Yagi T, Wakasa T, Sakurai M, Sato M, et al. Benign lymphoepithelial lesions with large cysts. Oral Surg Oral Med Oral Pathol 1990;19(6):226-70. Bhaskar SN, Colonel L. Lymphoepithelial cysts of oral cavity; report of twenty four cases. Oral Surg1966;21(1):120-8. Vickers RA, Von Der Muhll O. An investigation concerning inducibility of Lymphoepithelial cysts in Hamsters by autogeneous epithelial transplantation .J Dent Res 1966;45(4):1029-32. Knapp MJ. Pathology of oral tonsils. Oral Surg Oral Med Oral Pathol 1970;29(2):295-304. Younus S, Bleibel W, Bleibel H, Hernady N. Lymphoepithelial cyst of the pancreas. Dig Dis Sci 2007;52(11):3136–9. Little JW, Rickles NH. The histogenesis of the branchial cyst. AM J Pathol 1967; 50(5): 533-47. Yen TL, Murr AH, Rabin J, Mhatre AN, Lalwani AK.Role of cytomegalovirus, Epstein-Barr virus, and human herpes virus-8 in benign lymphoepithelial cysts of the parotid gland. Laryngoscope 2004;114(8):1500-5. Chaudhry AP, Yamane GM, Scharlock SE, Sunder R, M, Jain R. A clinico-pathological study of intraoral lymphoepithelial cysts. J Oral Med 1984;39(2):79-84. Merchant NE. Lymphoepithelial cyst of the floor of the mouth: a case report. Br Dent J 1972; 132(7):271–2. Sakoda S, Kodama Y, Shiba R. Lymphoepithelial cyst of Oral cavity. Int J Oral Surg 1983; 12(2):127-31. Guinta J, Gataldo E. Lymphoepithelial cysts of oral mucosa. Oral Surg Oral Med Oral pathol 1973;35(1):77-84. Acevedo A, Nelson JF. Lymphoepithelial cyst of Oral cavity: report of nine cases. Oral Surg Oral Med Oral pathol 1971; 31(5):632-6. Friedrich RE, Scheuer HA, Fuhrmann A. Bilateral intraosseous Lymphoepithelial cyst of the mandible. Invivo 2011; 25(3):451-4. Choi CJ, Choi SW, Cho JG, Woo JS. Bilateral lymphoepithelial cysts of the thyroid gland. Thyroid 2010; 20(1):111-13. Epivatianos A, Zaraboukas T, Antoniades D. Coexistence of lymphoepithelial and epidermoid cysts on the floor of the mouth: report of a case. Oral Dis 2005;11(5): 330-3. Pereira KM, Nonaka CF, Santos PP, Medeiros AM, Galvão HC. Unusual coexistence of oral lymphoepithelial cyst and benign migratory glossitis. Braz J Otorhinolaryngol 2009;75(2):318. Costa FW, Pereira KM, Viana TS, Cavalcante RB, Nogueira AS. Simultaneous occurrence of a rare lymphoepithelial cyst and squamous cell carcinoma in the oral cavity. Braz J Otorhinolaryngol 2011;77(2):270. Calman HI. Sublingual branchiogenic cyst-report of a case. J Oral Surg 1963;16(3):333–8. Buchner A, Hansen LS. Lymphoepithelial cysts of the oral cavity. Oral Surg 1980;50(5):441–9. Toto PD, Wortel JP, Joseph G. Lymphoepithelial cysts and associated immunoglobulins. Oral Surg Oral Med Oral Pathol Oral Radiol Endod 1982;54(1):59–65. Iwase T, Teratani K, Saito A, Funatsu K, Sato M, Kiuchi K, Umemura S. Immunohistochemical and lectin histochemical studies on the lymphoepithelial cyst of the oral cavity and neck. J Nihon Univ Sch Dent 1985;27(1):28–34. McDonnell D. Spontaneous regression of a yellow sublingual swelling: a case report. Pediatr Dent 1990;12(6):388–9. Kumara GR, Gillgrass TJ, Bridgman JB. A lymphoepithelial cyst (branchial cyst) in the floor of the mouth. N Z Dent J 1995;91(403):14–5. Flaitz CM. Oral lymphoepithelial cyst in a young child. Pediatr Dent 2000;22(5):422–3. Flaitz CM, Davis SE. Oral and maxillofacial pathology case of the mouth: oral lymphoepithelial cyst. Tex Dent J 2004;121(7):624–31. López-Jornet P. Oral lymphoepithelial cyst. Ann Dermatol Venereol 2007;134(6-7):588. Khelemsky R, Mandel L. Lymphoepithelial cyst of mouth floor. J Oral Maxillofac Surg 2010; 68(12):3055–7. Nonaka CF, Henriques AC, de Matos FR, de Souza LB, Pinto LP. Nonodontogenic cysts of the oral and maxillofacial region: demographic profile in a Brazilian population over a 40-year period. Eur Arch Otorhinolaryngol 2011;268(6):917–22. Arens R, Mc Donough JM, Costarino AT, Mahboubi S, Tayag-Kier CE, Maislin G, Schwab RJ, Pack AI. Magnetic resonance imaging of the upper airway structure of children with obstructive sleep apnea syndrome. Am J Respir Crit Care Med 2001;164(4):698-703. Tsou YA, Cheng YK, Lin CD, Chang WC, Tsai MH .Small B cell lymphocytic lymphoma presenting as obstructive sleep apnea. World J Surg Oncol 2004;2(1):26. Fidan H, Fidan F, Unlu N, Ela Y, Ibis A, Tetik L. Prevalence of sleep apnea in patients undergoing operation. Sleep and breathing 2006;10 (3):161-5.